In this magazine some time ago there was an enquiry about what tools one might recommend for someone wanting to set up what the writer called an “unplugged” workshop. This note struck home for me, because for more than 15-plus years that is exactly what I have worked towards. My training was as a greenwood chairmaker, studying at Drew Langsner’s Country Workshops classes. There, in addition to Drew, I first met John Alexander and a less-well known, but very special woodworker, Daniel O’Hagan. Over the years I have worked closely with John, and together we have made a lengthy study of seventeenth-century joinery traditions. 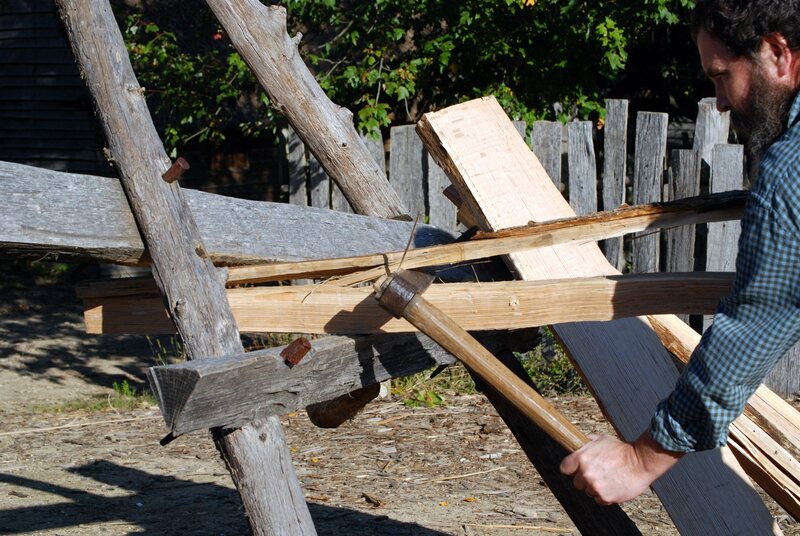 For the past eleven years, I have worked at Plimoth Plantation in Plymouth, Massachusetts, as the joiner and turner. 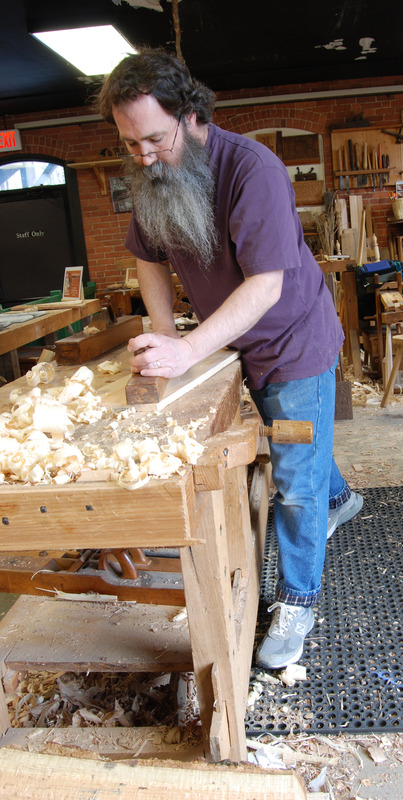 In this position, I meet thousands of visitors each year, who come into the shop and see me at work on all stages of making the reproduction furniture used in our re-created seventeenth-century houses. 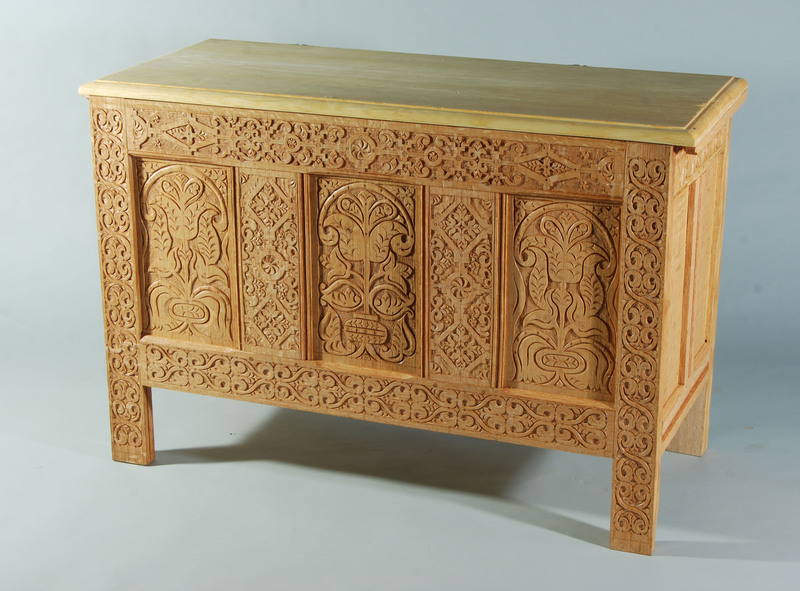 Because of the popularity of woodworking in general, there are visitors every day who have some knowledge of the craft, but have not usually seen someone working with hand tools, nor with green wood. A certain number of visitors, both woodworkers and non-woodworkers, are astounded at the level of complexity possible with only hand tools. When I describe that the stock is riven, or split, from the log, and worked from green wood, they are further surprised. I wish this were not the case. While these methods are perhaps not as applicable to someone making their living selling their wares, from my perspective, I am dismayed that there aren’t more people working this way. For the hobbyist it would be a great introduction to the craft, as well as a very pleasant way to pursue the creativity of woodworking. That these tools; the handsaw, plane, chisel, gauges, have fallen out of favor for the router, tablesaw, hollow-mortiser/drill press, etc leaves me confused. I recently saw a photograph of someone sanding some woodworking project, they looked to be outfitted for a lunar mission – dust mask, face shield, ear protection & gloves. I read of workers who use machines to perform the “drudgery” of stock preparation…I say give me that drudgery over standing behind a machine, engulfed by its sounds, breathing its dust, feeling its vibrations…and not really being part of working the boards. This parallels how I feel about using wood-bodied planes on riven, quartered green oak. Yes, one can plane a lot more board feet with a thickness planer than I can plane with my fore plane, smooth plane and jointer…but at my bench on a nice day with the windows open you can hear the songbirds outside between the strokes of the plane, or blows of the hatchet. Better yet, the hatchet work you can take outside. Breaking open the log is the heaviest work in the process. But there is something special about opening the stock and seeing which use each piece is best suited for. I typically work several pieces of furniture at once, usually a chest or two, some boxes and stools, perhaps a chair. When I’m riving the stock, I aim for one size of material that I need, and usually get some splits that, while not what I need at the time, are still of the best quality and good for something else. The quartered stock that results from riving ring-porous woods is hard to appreciate unless you feel it; it is even better than quartersawn wood from a mill. The riving process with wedges, froe and maul dictates that a true radial face results. This work requires very straight-grained stock free of knots, but for much furniture you can get away with short lengths. I am often able to pick out short sections here and there, sometimes three feet or less, sometimes even found in the firewood pile. I’ve also been able to get free logs from the sawmill because of embedded iron in them. The mill won’t saw them, but often you can split them in such a way as to isolate the metal in one section, the rest is fine. 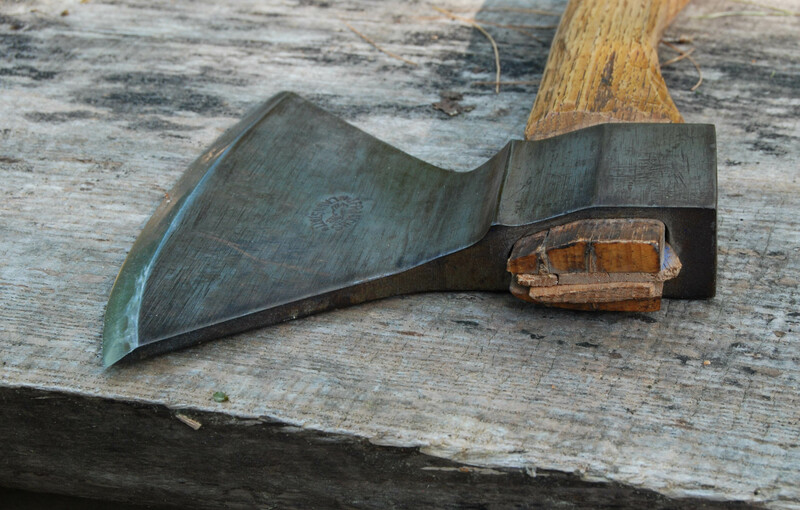 The hatchet is not really a tool encountered much in furniture trades these days, but again, it is surprising to people what a practiced hand can achieve with one. I usually hew and plane one face of the stock flat and smooth, then mark with a chalk line the thickness intended. I then hew off the bulk of the second face, and quickly finish with the planes. Depending on what I am making, the second face need only be generally smooth and flat, in most cases the stock is fine with an irregular cross section. The rhythm of the hand plane, each stroke slicing off a wide shaving, exposing new surface; then the return of the plane, followed by periodically checking the stock with straightedge and winding sticks creates a flow of effort and rest that is far from drudgery. The shavings present no health hazard, as is sometimes the case with the dust from a machine. The effort is good exercise, (a hidden bonus, no trip to the gym, no treadmill and Walkman) and what you learn about wood no machine can teach you so readily. 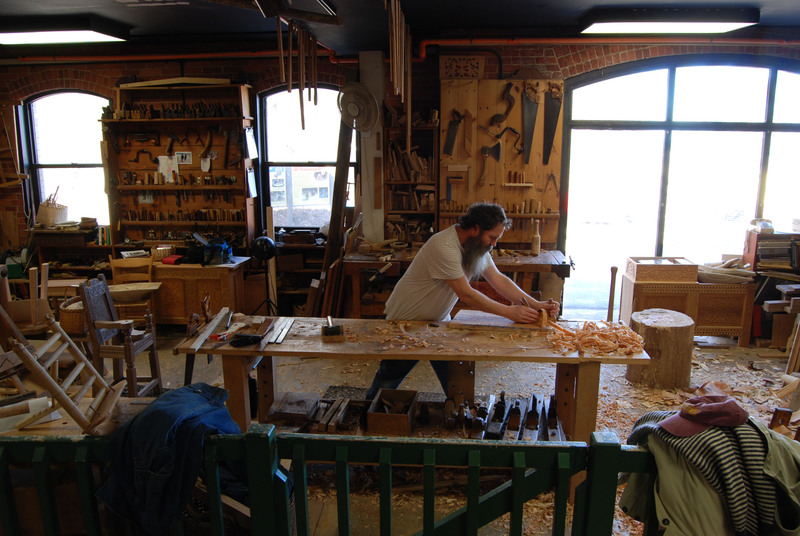 While the roots of my methods used in the Crafts Center at Plimoth Plantation are based on seventeenth-century practice, the process can be fitted to modern woodworking to great benefit. The combination of mortise and tenon work with frame and panel composition has served furniture craftsmen for centuries. I typically use about 3 or 4 different planes in the course of one piece of furniture; a scrub, or fore plane, a jointer – sometimes a jack plane in between; and a plow plane for frame and panel work. Sometimes I’ll use a skew-bladed rabbet plane here and there, often for tongue and groove work. My two favorite everyday planes were made in the 1870s. I probably paid less than $50 for each of them. They’ve been working for many, many years now, leaving countless boards smooth and flat. One of these planes in particular is as simple an object as can be – a single-iron plane (no cap iron), so just a body, handle, iron and wedge. Another jack plane I have shows wear marks on its side from workmen’s thumbprints. I often think of how many passes of a plane it takes to impress a thumbprint in beechwood like that. Other than chair-makers and bowl-turners I know of few woodworkers today who use green wood. Most folks are worried it will warp, crack and/or split; but in over 15 years of joinery work, I’ve had few problems. Because my workshop is part of the public display of the museum, I organize my work in a manner perhaps different from my seventeenth century counterparts, or for that matter, different from modern woodworkers as well. While modern practice is to prepare all the stock first, then proceed with joinery, etc, I typically will start a chest by riving & planing the stock for just the front of the chest; then I do the carving & joinery. I developed this method by default, as a concession to the museum;s visitors This way, in just a couple of days I can get something recognizable as a chest for them to see and discuss. 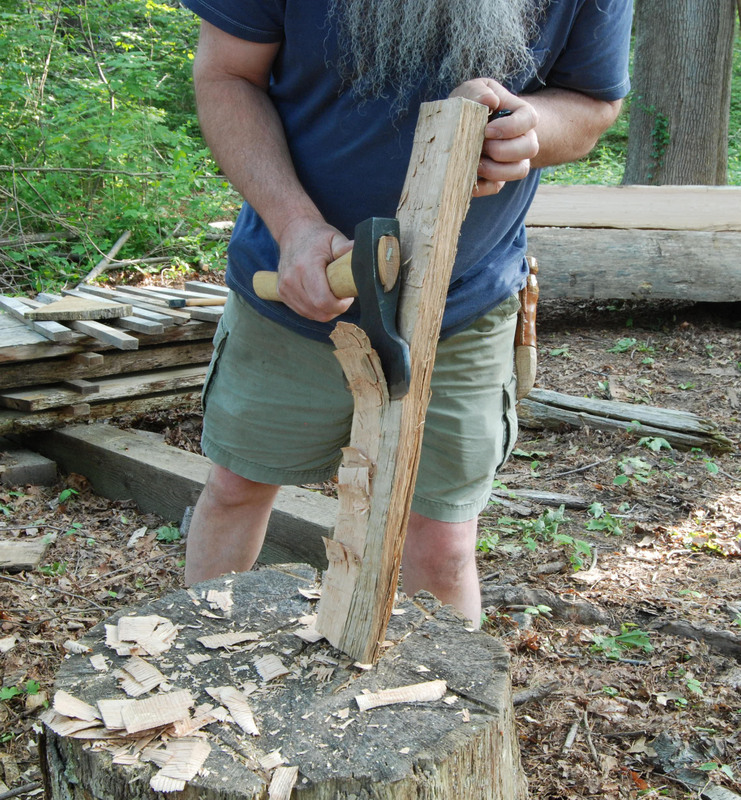 One benefit from this approch is that I usually don’t run into any problems with repetitive motion injuries; I mix up the heavy work of riving, hewing & planing with the less physically demanding work of joinery & carving. Likewise, the interaction with the museum’s visitors is a break from the work, allowing me frequent opportunities to rest between tasks. All in all, it’s a nice way to do woodwork for a living. While it’s a wonderful way to do woodwork for a living, there aren’t many jobs open in this particular field. But, the work and techniques are so exciting and rewarding that it is my hope that others might be enticed to try working this way. It is hard to convey in words and still pictures just what a powerful, yet simple, experience it is to rive green wood into such high-quality stock. Until you see it, even better feel it, you can’t grasp just how simple and effective this method is, how rewarding and exciting. It is my hope that some readers will dive into their firewood piles and try it out. It’s the best wood imagineable…. right on peter! I’m with ya…. Enticing indeed. A froe continues to climb up on my list of tools to get/buy/make list. Thanks for the inspiration! One of your best Peter. Thanks again. I like the way you articulate the reasons for enjoying your work with hand tools. I really hate loud noises and fine sawdust too and so I’ve been migrating towards hand tools myself after reading your stuff along with Schwarz’s and of course Roy Underhill. In fact, I’ve been in your shop (years ago) but you weren’t there. But Roy Underhill was! I ran into him eating lunch at the museum and since nobody was bothering him, I thought I would. I found him to be very affable and willing to tell me everything I wanted to know – which was a lot. He told me that they had been doing some filming (videoing?) through the night and that you and everyone else had gone home to sleep but he stayed. We ended up going into your shop where he explained how you used mostly green wood. He said that he would have hopped over into the shop and started showing me how to do it myself but decided not to; apparently thinking that they may need to come back for more video work and he didn’t want to get anything out of place. At least that’s how I remember it – that was probably in 2003 and many neurons have fired and died since then. It was memorable. If I can ever stop working and raising kids long enough, I intend to go to his school and spend a week learning something. Every time I see an article about riving oak, I look out back at the oak tree that needs to be taken down because it’s too close to my house and think “if I only had a froe…”. Just starting to get into woodworking (ex tooling engineer automotive) and finding the little and very rough – apart from anxiety of knowing it could/should be so much better!!! Tried finding Cris Schwartz’ book Anarchist, I saw some light but cannot find a reference anywhere – where do I find it? Keep up the good work all – practice makes perfect. Thank you Peter – time my “new” hobby started and with some guidance from these books – away to go!! Thank you for helping to keep the old ways alive. 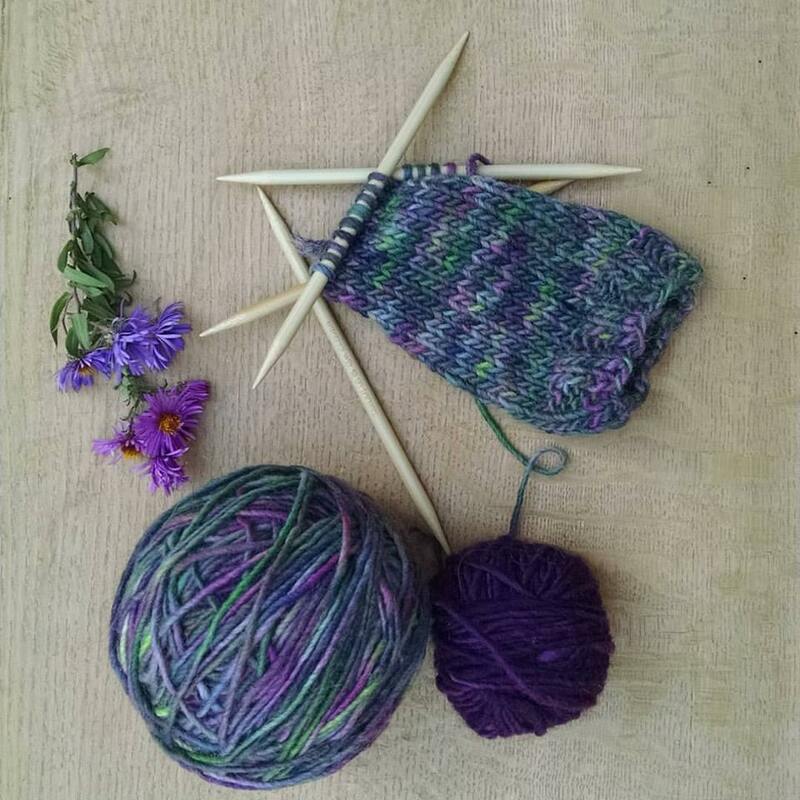 It boggles my mind that people consider techniques that were used for hundreds if not thousands of years as “outdated” or “inferior”. They were not always used for lack of something better – often they made superior goods than we have today. For example, european sword-making made use of a pommel that one would put on the heated tang and peen it over instead of the threaded pommels commonly used today. Why? Because when the sword impacts something, the force generated at the handle is like hitting it with a baseball bat, and cut threads WILL fail. I suppose cold rolled threads may work, but good luck generating the 3 or more tons of force to form them. For a long time I have wanted to see a series of books on how to set up a woodshop the old way, with emphasis on the space and cost savings as well as information on how much cheaper it is to get raw materials and the quality of work that can be created. You are right that in this age it is hard or impossible to turn a profit when competing with the volume that power tools can turn out, but for pleasure, I find that nothing pleases me as much as making a finished project without power tools. My name is Timothy Hickey, Bay View Builders, Inc., Plymouth, MA. I live right down the street from you (Bay View Ave.) I have what I think is a great woodworking shop and can’t spend hardly enough time in it (but that’s going to change). All and all I would like to stop by introduce myself and meet with you if that would be possible. I once took a boat building class with the other Peter and enjoyed every minute of it. Any way, I hope to meet you. 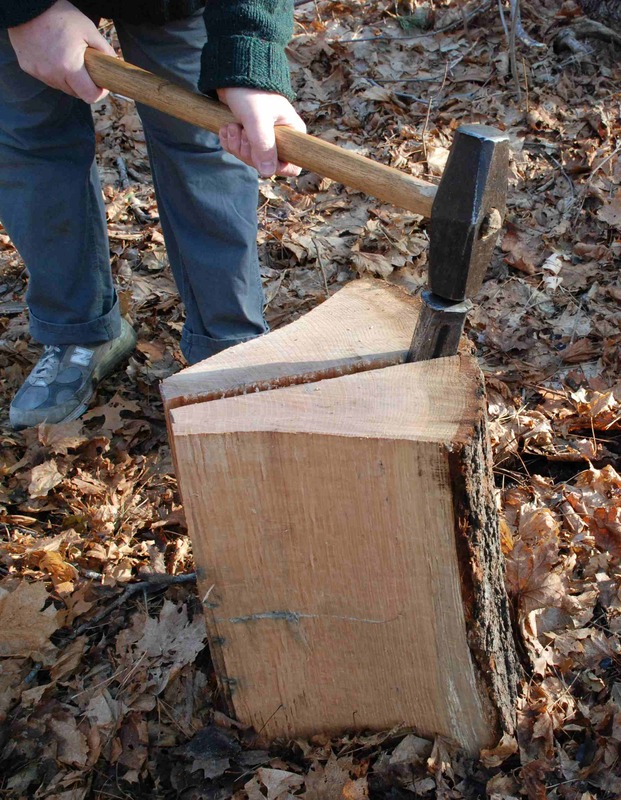 What would you say the basic needed start up hand tools are to go from oak log to basic chest without carving panels? And do you recommend a specific brand for quality? howdy, love your blog. I am honing my skills as a green wood worker. I am wondering if you have any articles on the “riving brake” and it’s construction. It is the next large tool that I need to build . Aspiring seedling-tree to finished-product woodsman.